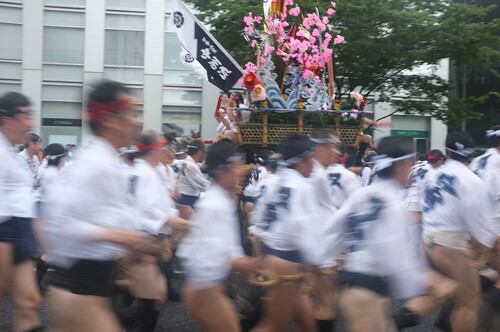 Hakata Gion Yamakasa is one of the most famous festivals held in Fukuoka. Though I could not go to the main event, I went to the pre-event show-off at the centre of Fukuoka Tenjin. I tried to shoot them with using echolocation, pan my camera as hearing them pass by, bu tThe the other noise from the crowd was overwhelming, so I could not follow the prople with portable shrine... so I asked my sighted guide to turn my body (not my camera!) around as the people pass by. The result is this shot. Since it was a cloudy day, I shot this with full manual, open aperture and 1/250 to show some movement. Thank you for your comment, Ray! And thanks for visiting my new blog!